Other gun murder-suicides in U.S.: Louisiana mass shooting far from only incident in last seven days. 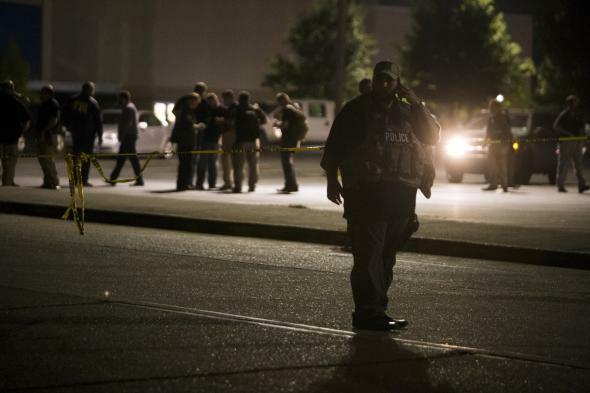 Police near the site of Thursday’s mass shooting in Lafayette, Louisiana. David Waldman of the Daily Kos site notes that Thursday’s murder-suicide shooting at a movie theater in Louisiana wasn’t the only incident of its kind in recent days. Yes, gun murder-suicide in Lafayette last night. Also in Vallejo, CA and Swansonville, WA. And Sewanee, GA & Jacksonville, NC on Wednesday. Friday, July 17, Chicago. A 38-year-old man is believed to have shot and stabbed his 72-year-old father and his 29-year-old brother at the father’s home, killing them, before shooting and killing himself. Friday, July 17, Perry Hall, Maryland. A 47-year-old man is believed to have shot and killed his 12- and 10-year-old sons before killing himself. Thursday, July 23, Mason County, Washington. A 52-year-old man is believed to have killed a 17-month-old child before killing himself. The Washington incident that Waldman referenced is not included above—but only because the 33-year-old man who is believed to have shot and killed a 20-year-old woman on Thursday survived his suicide attempt. In total, then, there were at least 38 Americans who died in the last week in gun-involved murder-suicides or attempted murder-suicides. *Update, 4:40 p.m.: Daily Kos’s Waldman pointed out on Twitter that our initial post missed the killing in Mauldin, South Carolina. It’s been added to the list and the statistics elsewhere in the post have been updated.